By Buy Button Not Working? This is a really good podcast for anyone who looks fondly on the 80’s. Movies, music and tv from the greatest decade are all covered. Events that changed us as a society are covered. Brad and Steve have a great rapport and the guest ch-hosts really add their own fun personalities to the episodes. Brad, for the love of God, please stop saying 'woot-woot'. 13 years after it began I finally discover one of the best podcasts out there. Thank you to Steve Spears for all the great work! It's one of the best edited & produced podcasts out there. The chemistry between Spears, Daly & Wos is fantastic in the early shows. Those episodes are on their own tier of brilliance. As a fellow podcast host/producer, I know the work behind it & I congratulate you for keeping this going. When Sean Daly left 5 years ago, this podcast has just not been the same. I enjoy Steve Spears and the various guest hosts, the seggies, What's your 80's obsession, etc, but all of this great stuff is almost cancelled out by the other host - Brad in L.A. I'm sure Brad is a nice guy, but a host on a podcast he is not. He just doesn't have the charisma or the sense of humor required to be likeable. Anyone who laughs at his own jokes is just to irritating to listen too. I do still listen to this podcast because I enjoy Steve Spears and I grew up in the eighties and love the various segments of the show. Steve, please get rid of the nerdy engineer in L.A. and bring back the wild and crazy Sean Daly! This show could be so much more by ditching Brad. Brad should be behind the mic as the little heard, never seen, engineer. Leave the host duties to people with charisma and a sense of humor. Having “came of age” in the eighties, this was a great find for me. Hosts are engaging and the topics are interesting. Give it a listen. Love this podcast. Sean and Brad are fantastic to listen to. If you live the 80's you will not be disappointed. Show is great. I want to go back and start at the beginning but have not made the leap yet. I have been a fan for like 2-3 yeas now and can’t believe I say the segues every time love the latest Halloween episode it was cool when you played whodini. I'm a child of the 80s, simply put. There's been so much of the peices of pop culture childhood showcased on this show that it's brogut hme back and back again to one of the pivotal periods of my life. A more fun time in some regards, different of course as everything is in childhood, and it's great to recall those moments through this show and remember how easy it is to have fun. I wish this was a daily morning show on the radio. For me, it's not the pop culture content, but rather the personal 80s and present day anecdotes from the hosts. Steve Spears is a treasure! B-rad and Jen with One N are delights. Sean Daly's coming of age stories were side splitting. Please make Gayle a regular contributor. She brings a great perspective to the show. My favorite podcast. I eagerly await every episode! One of my favorite podcasts out there, every show makes me laugh. A+. An 80's podcast where the just seem to crap on most things 80's, especially if it was popular. I get it, you were to hip and to cool for the mainstream pop culture back in the day. Get over yourselves. Great show on all things 80s! As refreshing as an ice cold beer, at a crappy motel, in a city in bum f**k Egypt. I love this show. It is among the first podcasts I listened to, and it transports me back to my teen years with the great interviews and conversations. I'm a couple of years younger than Spearsy, but I still enjoy his flights of fancy and passions for the decade of my youth! Daly leaving felt like a huge blow to the show, but Brad has come a long way and helped keep the show alive and fun. I look forward to each and every new episode, even when the topics or guests are not of my particular taste. Keep it going! And please, take me along in your luggage for the 80s cruise. I am a huge Huey Lewis and The News fan! I've been listening since back in the Gina days. I've got to say I've tried listening to other podcasts but my heart belongs to SIT80's. There is just no comparison. A podcast about the '80s could get boring after 300 episodes. However, Stuck in the '80s has continually produced quality content with amazing guests for the past 9 years. It's far from boring. Every episode keeps me laughing and entertained. I wasn't sure if Stuck in the '80s would survive without Sean Daly but Brad Williams has done an amazing job of stepping into the role of co-host. I think Brad has developed his own voice and added a refreshing and new look at our beloved '80s. Finally, it wouldn't be the greatest podcast out there if Steve Spears wasn't sharing his love of all things '80s. The man has done a phenomenal job of bringing the greatest decade ever back to life. I just can't quit Stuck in the '80s. One of the best podcasts on iTunes today. It delivers time after time. Steve and Brad Get it, so many memories, so many issues, so many great guests. A keeper. Really enjoying listening to these podcasts. Brings back so many memories of high school and college. Love all the 80’s new wave music. If you love the 80's, this is the podcast for you! Great stores, great interviews!! As an 80's child this is the best...it's great reliving all the pop culture stuff from my youth. And it even has opened me up to other 80s movies, music, etc. The hosts are pretty funny and I can relate to alot of their stories of teen angst. I feel sorry for anyone who did not get a chance to spend their childhood and adolescence in this great decade! I got in on this podcast very late, and I worked my way back through most of the episodes...it seems that the show is on hiatus now that cohost/founder Steve Spears has moved to Orlando and changed jobs. If you haven't heard this podcast you're really missing out. I don't even think its appeal is so much about the eighties as it is the friendship between Steve and Sean Daly (and Cathy Wos). I don't really miss the eighties for the music so much as being a kid in a world that seemed like it had it together. There might never be another time like that, and when you hear people like Sean and Steve having fun and reminiscing it feels like you're part of something special. Thanks for the fun, guys. Sean and Steve are always entertaining and informative. If you grew up in the 80s, this is the definitive podcast. Sean Daly is my hero! I have listened to Sean's podcast for years and am never disappointed. Keep up the good work man. You guys F'n ROCK. Loyal listener! Love the show. It truly takes you back in time. Anyone who grew up in the 80's will enjoy the memories. Thanks for giving me something to enjoy on my commute to work and on my lunch break. I love "Stuck in the 80s"!! Love the podcasts!! Love the blog! Love these guys! Love the 80s! Love this show but why no more? Did they get fired? Love this show, been listening for years, It's super funny and fun!!! Thank you guys! Love the chemistry, love the movie clips, love the music of course. Very funny and enjoyable. Well done guys. What a podcast should be! Whether you grew up in the 80s or are just a fan, this podcast will always keep you entertained and involved. Great variety of topics, trivia and interviews. Plus, hosts are funny as hell. My only wish would be that it was done more often. These guys ARE your 80's best friends in high school. They are familiar and funny! I listen to XM talk. I love O&A and Ron & Fez. Steve and Sean are just as professional and likeable. I hope they make it in the big time soon. BE forever stuck in the 80's! I found this podcast a couple of weeks ago. It is simply excellent. The hosts have a lot of fun with the subjects and also provide lots of insights of movie and music from this great decade. If you love the eighties, this podcast is a must have! Thanks guys and long live your podcast! Even though I find the 1980s (except 1980-81) a culturally, socially, politically & artistically vacant decade, I do love this podcast. I've listened since episode 1 and find it brings back a lot of memories from high school (graduated in '87). I couldn't stand the 80's during the 80s and I don't like them any better today, but this podcast is great. Steve and Sean have great chemistry and pick fun topics. 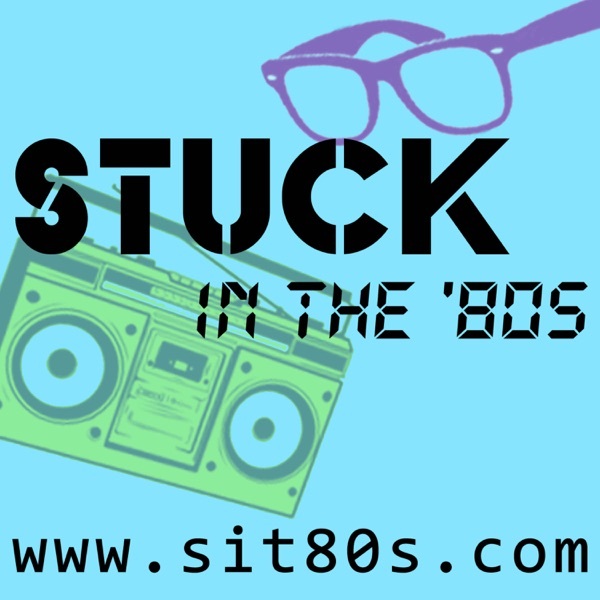 So glad I found you so I get stuck in the 80's with you = super fun podcast, and great sound quality, love it! As a podcaster myself, I know how much effort it takes to really put together a polished and entertaining show. Stuck in the 80s has both those qualities, but both pale next to the fun the hosts have while recording the show. Fantastic stuff, and you WILL enjoy it. This is one my favorite podcasts. The hosts are the best. The topics and guest interviews are always great. Not to be missed. Love this podcast, favorite one so far was the John Hughes Show..
Love this podcast, the co-hosts are great, favorite one so far was the John Hughes Show with the music and movie clips made me cry. Keep up the freat work guys. I have listened to Shatner's new bio and Movie Memories ( both narrated by WS and recommended) and must note that this podcast has a poor understanding of the Trek movies. A case in point is the critique of STV FF where they assert that Roddenberry's vision was undone by the religious focus. Shatner's books note that Roddenberry was obbsessed by religion. If you love the 80's, this is THE podcast for you! I'm a recent convert, but I'm already addicted!! Love them! !